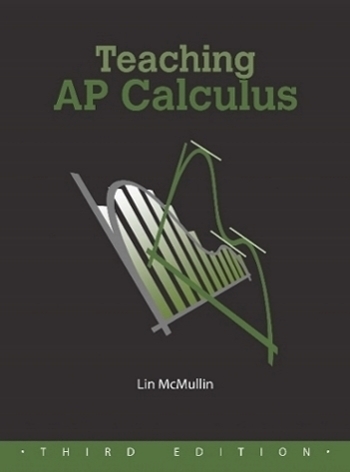 There is a lot to put together in the new AP® Calculus AB and AP® Calculus BC Course and Exam Description (CED). Today I’m going to show you a way to organized all of this and arrange it to plan you lessons and your year. Don’t worry: I’ve done the tedious part for you and we’ll get to that in a few minutes. The key to this is an app called Trello. Go to www.Trello.com and sign up (free) for your own account. 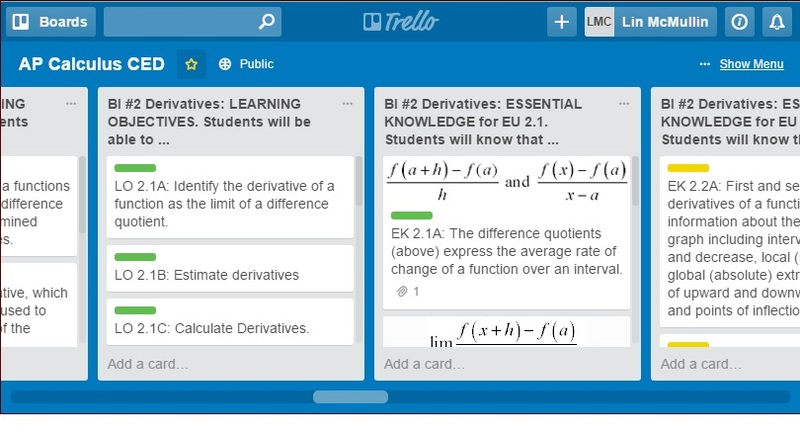 Trello is an electronic cork board. You put your ideas and notes on “cards” and tack them on the board to make lists. It was a great help recently when we moved from Texas to New York: we made “To Do” lists for my wife, and me, and for both of us. As we completed the items we moved them to a “Done” list – except they’re not all done yet!. Bookmark Trello on your computer. While you’re there look at their tutorials. Play with a little and you’ll catch on quickly. Everything you do will be saved and available on all your devices. There are Trello apps for iPads and other tablets and phones. While it may look a little overwhelming at first, remember that there are only three objects to consider: boards that contain lists, lists that contain cards, and cards. Once you have the idea go to https://trello.com/b/BlwGasNb . This will open a board called “AP Calculus CED” in your Trello account. I suggest you immediately copy the board so you have your own copy to rearrange for you own use. To do this on the upper right side click on “… Show Menu,” then click on “more,” and finally click on “copy board.” Give it a new name when prompted. Your new board will be ready to help you plan your year. Take a look at the AP Calculus CED board. The first 6 lists after the notes are the MPACs. The next groups of lists are the 4 Big Ideas (BI). For each BI there are lists for the Enduring Understands (EU), the Learning Objectives (LO), and several Essential Knowledge (EK) lists.On each list, each card contains one item numbered as in the CED. The color coding refers to the appropriate LO for that Big Idea. (There are only so many colors, so the colors are reused in each LO list.) Hover over the colored bar to see what it refers to.The final list on the right lists the Instructional Strategies. Here is how you can use the AP Calculus CED board to organize and plan your lessons and your year. Make your own list for each unit or week of your course – whatever works for you. To do this scroll to the far right. You will see “Add a list …” Click on this, give the list a name when prompted, then click save. Let’s say your list is “Unit 4: Applications of the derivative.” Drag the list and place it near the Essential Knowledge lists for derivatives. Choose which EK you want in this unit and drag the card from the EK list to your new list. Arrange them in the order you want. If you want to add a topic that is not on the EK list, just click on “Add a card” at the bottom of your list and type what you want, save it, and move it to the position in the list where you want it. As you go through your planning the original lists will empty. As the list becomes empty you will see what you have yet to include. For example, by the time you get to derivative applications most of your Limit lists will be empty except for L’Hospital’s Rule; drag this card to the Applications of derivatives list. You will probably use the EK cards only once. The MPAC and Instructional Strategies are used across entire course. The way to handle this is to copy the card and move the copy. To do this left click on the card and the “back” of the card will open. I’ll discuss the “back” of the card next, but for now just find and click “copy” on the right side. Then click “create card” at the bottom. This will place a duplicate card in the same list. Move it to where you want it. If you left click on any card its “back” will appear. This is a nice feature of Trello. On the back of the card you can do several things. Some of these will help you this year and others will help you in the future. reflections on what went well and what did not – so you can address them next year. Labels – click this to color code a card or remove the code. The “Activity” list at the bottom of the card automatically notes the additions and changes you made to the card. This is mostly for teams that contribute to a board – so everyone can see who made changes and what the changes are. The original board is quite wide and when you add your own lists it gets wider. To alleviate this crowding you can make new boards. Once you’ve planned a unit you can move that list to a new board. After creating a new board (explained above), click on the “ …” at the top right of a list. Click on “Move list …” Select the destination board and click and “move.” If you want to keep the list and move it, make a copy and move the copy. 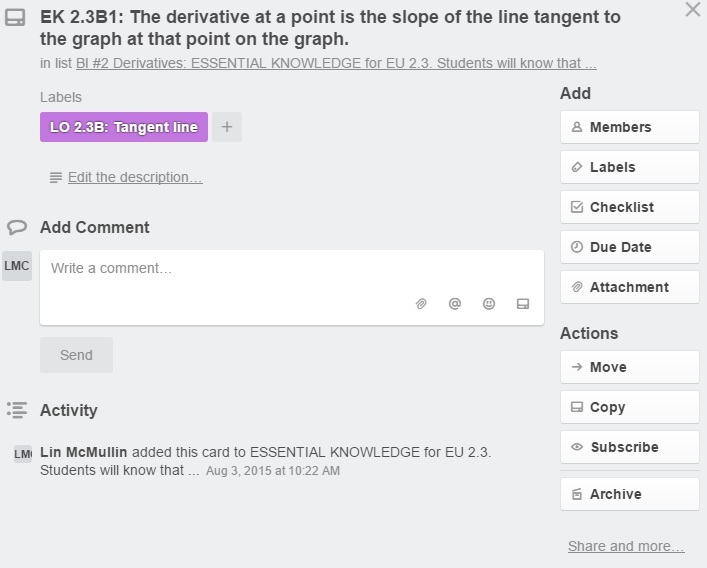 If you are fortunate enough to work with another teacher or two, form a team by (1) clicking on the “+” sign in the upper right, then (2) clicking on “Private” in the upper right and choosing “team” and then (3) clicking on “…show menu” and add members. And that’s it. I hope this helps. Now I’m going to use Trello to plan my APSI. Wow! What a phenomenal resource! This will be a huge help to organize my units this year and share them in realtime with admin and students! Thank you!